Mile repeats have been a big part of my marathon training thus far. It seems that every week, Coach (aka Dad) puts crazy mile repeats on my schedule. While torturing our bodies this morning on the street, my friends and I kept naming off our various ailments. And we had quite the list. 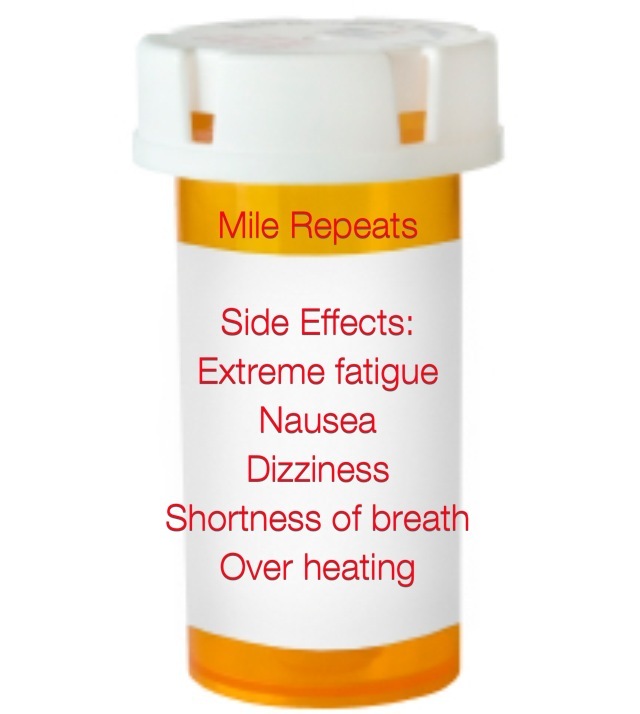 We joked that our list was like a side effect label on a pill bottle….so I decided to make it reality. And although this run sucked this morning, we still rocked our repeats. Mine coming in at 7:21, 6:41, 6:38, 6:33, 6:37. And I can only hope that the best side effect of all with these mile repeats is a marathon PR! Awesome work this morning. Coach knows best! Yes, yes we did rock them out! I will be sure to stay away from that medicine bottle from now on. Very dangerous! hahaha i love this. but it’s so freakin true. add tingling in arms/hands to the list. that always happens to me. not gonna lie- i’ve only dared to do 3 miles. it’s my goal to get to five by oct. deal lord…. good job girl! those are good times! How cool that your Dad is your running coach! What are mile repeats? Running a mile as fast as you can, over and over? Do you rest in between? Those splits are freaking fantastic! PR CITY! Awesome times, keep up the good work. That sounds fsntaatic!! Good for you.Hope you had a great holiday, Zanne. BTW, wanted to tell you, you don’t have to skip 9 on the 9th. You can just give us 9 of your marathon miles. We are pretty lenient around here. I know you will have bigger things on your mind, so if you don’t, no biggie, just thought you might want to peak at the watch at nine and send me a time. 😀 Happy New Year and good luck in the last preparations for plan B.